TLDR; Keep task discussions in the forum. GitHub Issues are just for task metadata. Tasks associated with code will have an issue created in GitHub, but all dialog regarding tasks will reside on the forum in a topic containing the github Issue ID of the task. A task is something actionable that results in some sort of tangible output. ex: code, documentation, QA findings. Example sources of tasks include: feature requests, bugs, QA, general following of development roadmap. Not all support issues are tasks, but a support issue can generate a task. 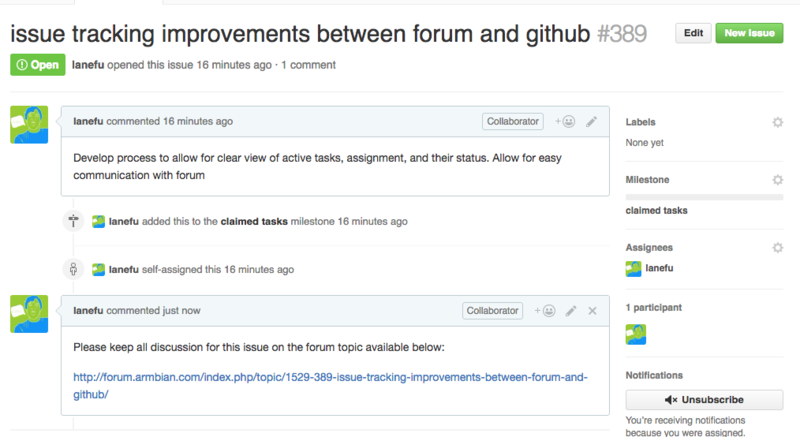 GitHub Issues provide an easy method to track and filter tasks by using tags and milestones. Issues also make it easy to easily associate commits and merge requests with a task. Effectively we just use GitHub issues for the metadata for reporting. Use labels identify the purpose of a task. not-our-bug is used to identify tasks that are bugs in upstream code. They are not Armbian bugs, but may impact Armbian. enhancement is used to identify tasks that are new features for Armbian. Use milestones to divide tasks into claimed and unclaimed work. claimed tasks milestone contains tasks which have been assigned. unclaimed tasks milestone contains tasks that need an owner. Sometimes support discussions can become tasks. A forum admin can assist in moving the topic to Tasks forum group. A cooresponding issue will need to be created. Ideally we can have a forum topic created upon issue creation. This will save some time.